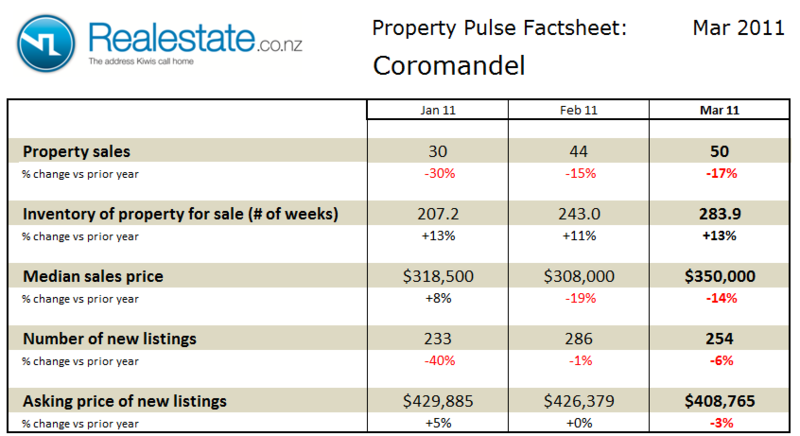 The Coromandel district property pulse factsheet for July 2012 is published using data from Realestate.co.nz and REINZ (Real Estate Institute of NZ). Property sales in the Coromandel region totaled 42 in the month of July, this represented a rise on a seasonally adjusted basis and also showed a 5% rise as compared to a year ago. The inventory of unsold houses rose to 200 weeks of equivalent sales. This represents an 18% rise in inventory as compared to July last year and places current levels equal to the long term average. 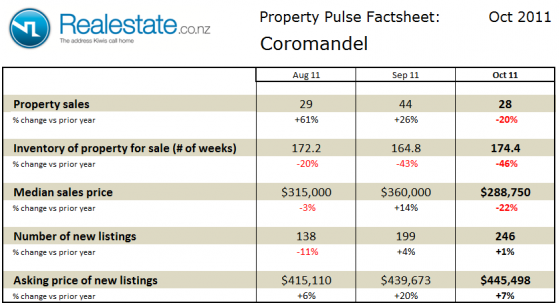 Median sales price for property sold in the Coromandel in July at $312,500 a fall of just 1% as compared to a year ago and down from the prior month. The asking price expectation of new listings was down 1% as compared to a year ago at $421,153 but up significantly on the June level of $421,153. The level of new listings coming onto the market in July at 209 was up 8% as compared to a year ago and up from June indicating a start of a seasonal rise as the market heads into Spring. The data indicates that the Coromandel region is a fairly balanced market with inventory levels right on long-term average which means that neither buyers nor sellers have the upper hand. Sales activity is steady as are sales price, the key driver of the market in the coming months will be governed by the supply side of new listings matched to sellers asking price expectations. The Coromandel district property pulse factsheet for June 2012 is published using data from Realestate.co.nz and REINZ (Real Estate Institute of NZ). 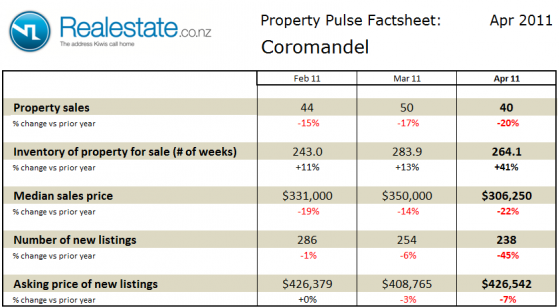 Property sales in the Coromandel region at 45 in the month fell on a seasonally adjusted basis in June and also showed a 15% fall as compared to a year ago. The inventory of unsold houses fell to 170 weeks, reversing the rise seen in May, this takes the inventory back below the long-term average at 198 weeks of equivalent sales. Median sales price for property sold in the Coromandel in June at $330,000 a significant fall of 12% as compared to a year ago and down significantly from the prior month. The asking price expectation of new listings was down 13% as compared to a year ago at $387,634. The level of new listings coming onto the market in June at 170 was down 27% as compared to a year ago. 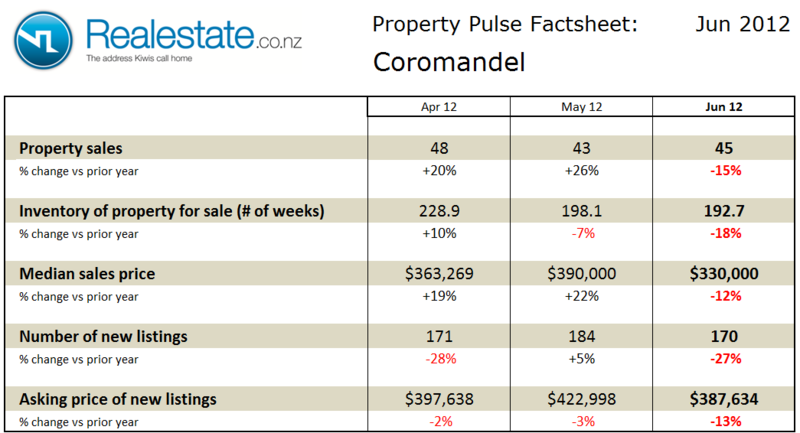 The Coromandel district property pulse factsheet for May 2012 is published using data from Realestate.co.nz and REINZ (Real Estate Institute of NZ). Property sales in the Coromandel region at 43 in the month was flat on a seasonally adjusted basis in May and showed a 26% rise as compared to a year ago. The inventory of unsold houses fell to 184 weeks, taking it back to the long-term average at just under 200 weeks of equivalent sales. 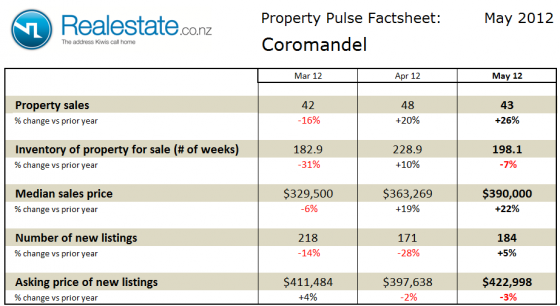 Median sales price for property sold in the Coromandel in May at $390,000 a significant rise of 22% as compared to a year ago and significantly up from the prior month. The asking price expectation of new listings was down 3% as compared to a year ago at $422,998. The level of new listings coming onto the market in May at 184 was up 5% as compared to a year ago. 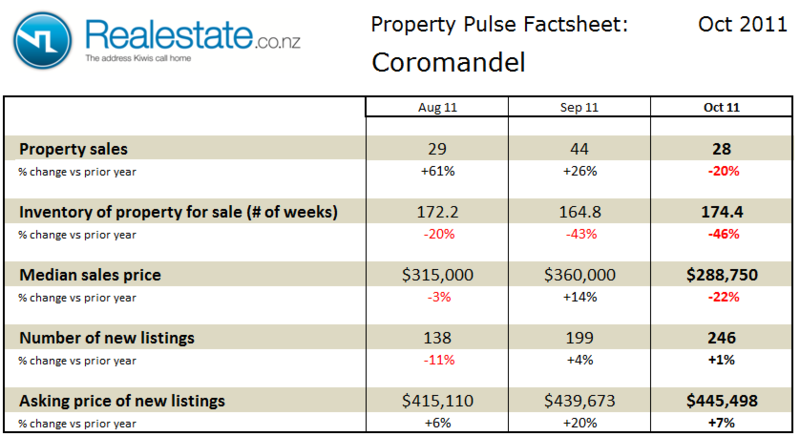 The Coromandel district property pulse factsheet for November 2011 is published using data from Realestate.co.nz and REINZ (Real Estate Institute of NZ). Property sales in the Coromandel region at 52 in the month rose significantly on a seasonally adjusted basis in November and showed a 13% rise as compared to a year ago. The inventory of unsold houses rose to 207 weeks, taking it back to the long-term average at just under 200 weeks of equivalent sales. Median sales price for property sold in the Coromandel in November at $378,750 a significant rise of 17% as compared to a year ago and significantly up from the prior month. The asking price expectation of new listings was up 23% as compared to a year ago at $439,045. The level of new listings coming onto the market in November at 247 was down 29% as compared to a year ago. 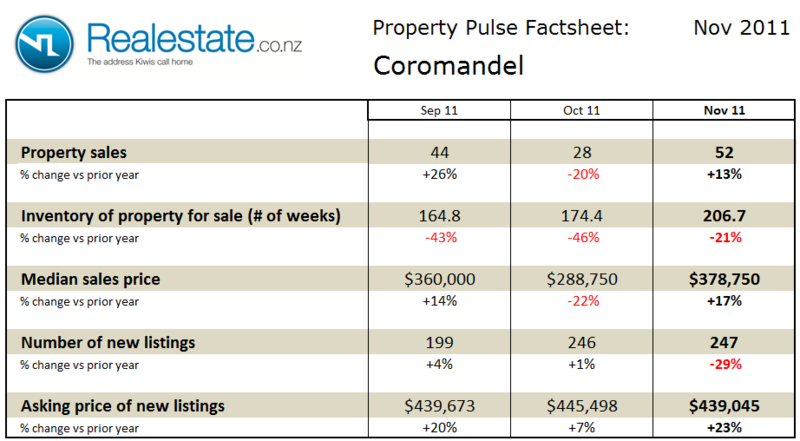 The Coromandel district property pulse factsheet for October 2011 is published using data from Realestate.co.nz and REINZ (Real Estate Institute of NZ). Property sales in the Coromandel region at 28 in the month fell significantly on a seasonally adjusted basis in October and showed a 20% fall as compared to a year ago. The inventory of unsold houses rose to 174 weeks, although it stil remains below the long-term average at just under 200 weeks of equivalent sales. Median sales price for property sold in the Coromandel in October at $288,750 was down 22% as compared to a year ago, and significantly down from the prior month. The asking price expectation of new listings was up 7% as compared to a year ago at $445,498. The level of new listings coming onto the market in October at 246 was up 1% as compared to a year ago. 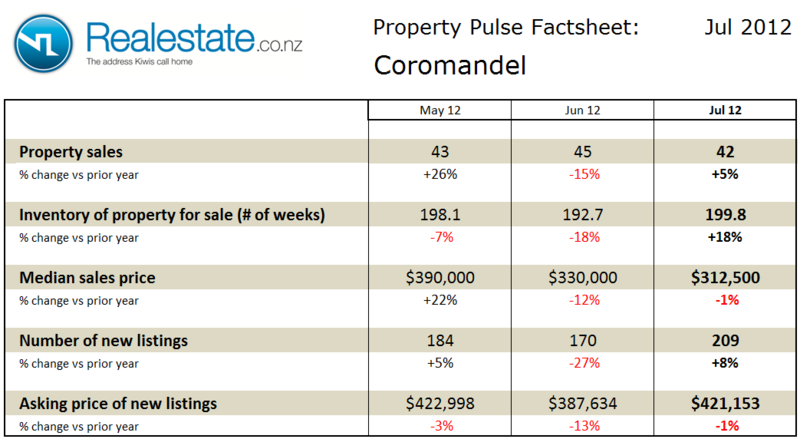 The Coromandel district property pulse factsheet for May 2011 is published using data from Realestate.co.nz and REINZ (Real Estate Institute of NZ). Property sales in the Coromandel region at 34 in the month fell on a seasonally adjusted basis in May and showed a significant 31% fall as compared to a year ago. The inventory of unsold houses fell again to 223 weeks edging back down to the long-term average at 198 weeks of equivalent sales. 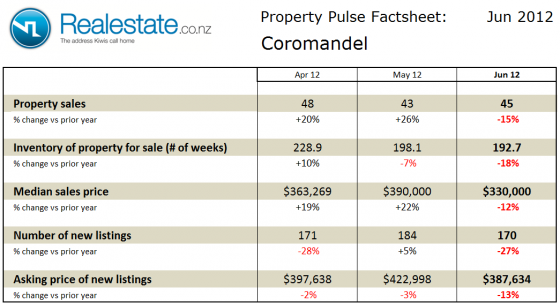 Median sales price for property sold in the Coromandel in May at $320,000 was down 17% as compared to a year ago, although up from the prior month. The asking price expectation of new listings was also up 7% as compared to a year ago at $417,330. The level of new listings coming onto the market in May at 175 down a significant 49% as compared to a year ago. 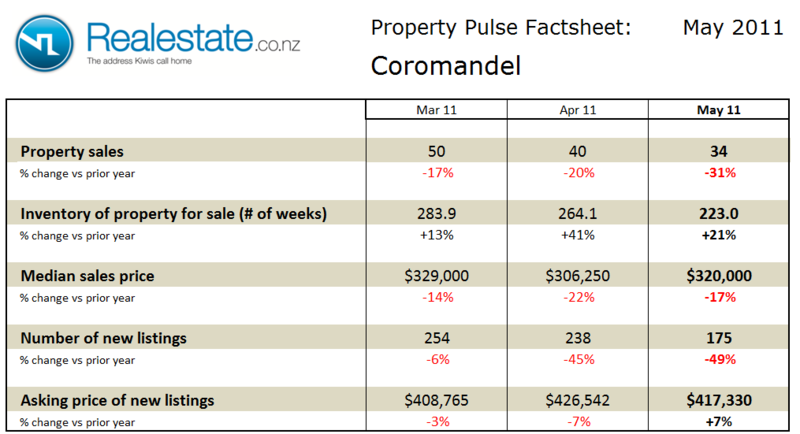 The Coromandel district property pulse factsheet for April 2011 is published using data from Realestate.co.nz and REINZ (Real Estate Institute of NZ). Property sales in the Coromandel region at 40 in the month fell slightly on a seasonally adjusted basis in April and showed a 20% fall as compared to a year ago. The inventory of unsold houses rose again to remain well above the long-term average at 264 weeks of equivalent sales. 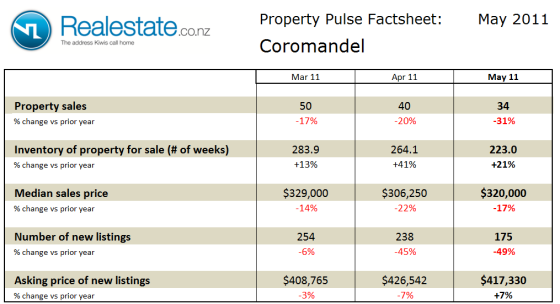 Median sales price for property sold in the Coromandel in April at $306,250 was down 22% as compared to a year ago, and significantly down from the prior month. The asking price expectation of new listings was also down 7% as compared to a year ago at $426,542. The level of new listings coming onto the market in April at 238 down a significant 45% as compared to a year ago. 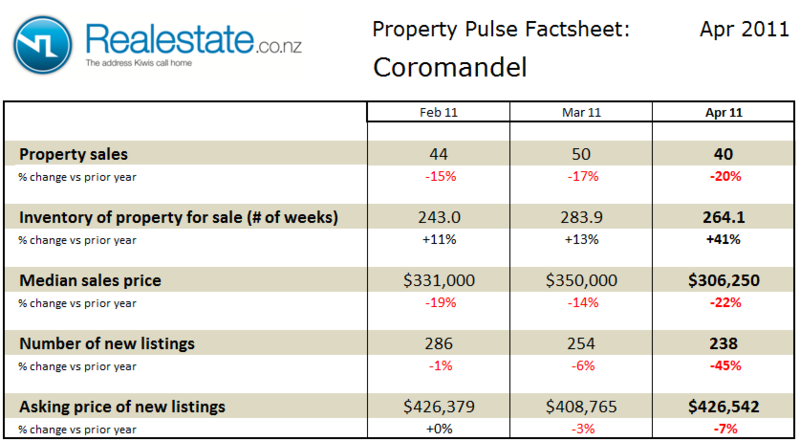 The Coromandel district property pulse factsheet for March 2011 is published using data from Realestate.co.nz and REINZ (Real Estate Institute of NZ). Property sales at 50 in the month barely rose on a seasonally adjusted basis in March and fell 17% as compared to a year ago. The inventory of unsold houses rose again to remain well above the long-term average at 283 weeks of equivalent sales. Median sales price at $350,000 was down 14% as compared to a year ago but up from the prior 2 months. The asking price expectation of new listings was also down 3% as compared to a year ago at $408,765. The level of new listings coming onto the market in March at 254 was down from February and down 6% as compared to a year ago. The Coromandel region Property Market factsheet for October 2010 can be downloaded by clicking this icon. 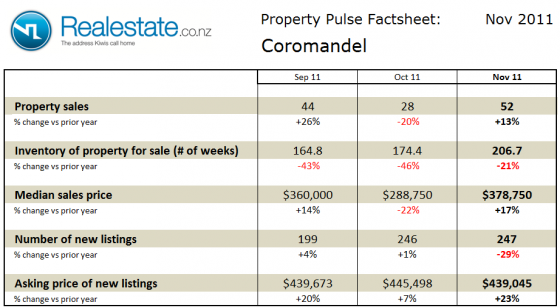 Property sales in the Coromandel recovered in September from what had been a very serious midwinter decline. On a seasonally adjusted basis sales shot up by 121% with 35 actual sales compared to 37 in total in July and August combined. For the year to date sales are well down with 360 in 2010 vs. 442 in 2009. The inventory of houses on the market shot up again in September to 289 weeks – an all time high. This level of inventory is now way ahead of the long term average of 172 weeks. This would indicate that the market is fairly well balanced between buyers and sellers. Property prices for the Coromandel are included in the broad Auckland regional median property price, in September this price was $450,000 a level that has been fairly flat for the past 5 months. As compared to a year ago prices are down 1.1%. The Coromandel region Property Market factsheet for August 2010 can be downloaded by clicking this icon. Property sales in the Coromandel suffered a significant fall in July. On a seasonally adjusted basis sales fell by 54%. There were just 19 sales in July as compared to 47 in July 2009. On a moving annual total basis sales are up 16% with 591 sales in the past year. Inventory of houses on the market flat-lined in July at 173 weeks of equivalent sales. This level of inventory is consistent with the long term average of 172 weeks. This would indicate that the market is fairly well balanced between buyers and sellers. Property prices for the Coromandel are included in the broad Auckland regional median property price, in June this price was $450,000 up slightly from the June figure of $445,000 reversing a three month trend of falling prices. As compared to a year ago prices are up 2.3%.